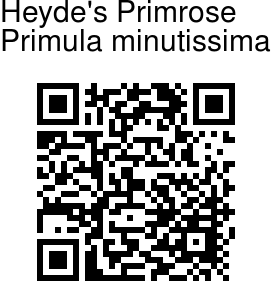 Heyde's Primrose is named in honour of Enrique Teophila Heyde, Guatemalan cleric and plant collector. It is a tiny plant growing in dense tufts with rosettes of leaves and with stemless purple flowers much larger than the tiny leaves. It may be confused with Creeping Primrose. Flowers are 8-13 mm across, flower-tube much longer than the hairless calyx, petals deeply notched Leaves are densely crowded, narrowly oblong to lanceshaped or inverted-lanceshaped 5-10 x 1.5-3 mm, densely powdery on the underside, base narrowed, margin toothed above middle, tip acute to long-pointed. Fruiting stems are up to 5 cm long. 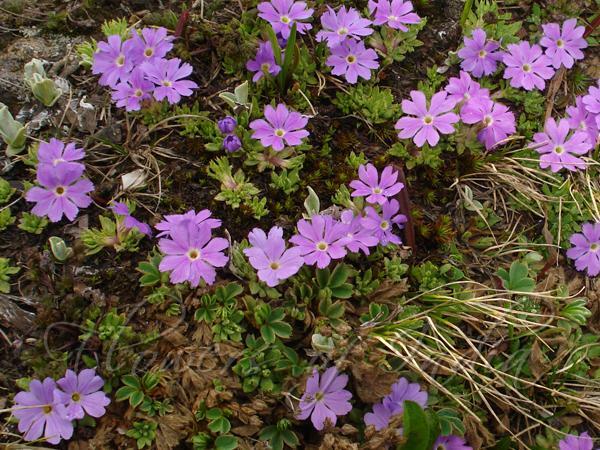 Heyde's Primrose is found in the Himalayas, from Kashmir to C Nepal, at altitudes of 3600-5200 m. Flowering: June-July.